I wanna be a cowboy… (just not in this film). There are some times that I can see the future so clearly that I swear I am at least partially psychic. Ahhh that’s the good stuff. And there’ll be the mutual ‘good one’ chuckle which will quickly tail off, followed by the watcher hoping against hope that a more detailed description is required. Because there really isn’t one. Because Cowboys and Aliens is a far easier product to sell than it is to watch. I mean Indiana Jones and 007 facing off against a bunch of nefarious ETs? I’m finding it hard to go to sleep with this perpetually raging nerd-on. But now I’ve watched it and can think of not one scene, moment or idea that was even vaguely creative aside from the aforementioned casting and title, meaning Cowboys and Aliens is everything you expect, only somehow much less. Jake (Daniel Craig) awakens in the blistering desert sun, bleeding, bedraggled… and bangled, as affixed to his arm is some otherworldly ‘Leela from Futurama’ like contraption. But that isn’t so important right now, as Jake not only doesn’t know what the thing on his arm is, he doesn’t recall exactly who he is. Shortly after though he comes across three rogues hell bent on doing him harm, and he swiftly proves to the trio – and himself – that he is at least not someone to be messed with casually. With this knowledge – and a spiffy new black cowboy hat that was filthy only seconds earlier – Jake moseys into the town of Absolution. Jake quickly gains notoriety after a run-in with the shitbag son of a local big-wig, finding attention he wants no part of. He decides to head to the saloon and drink his memory back, however his newfound local fame has spread and he is recognised as Jake Delaporte, a wanted man with a price on his head. Right, cowboy part over. After an unforeseen air-raid of sorts that sees many locals lassoed away to places unknown, a tenuous alliance between some of the remaining locals including Jake and Dollarhyde is formed, and the group head off on horseback for a totally non-remarkable final hour. The locals see Jake’s wrist accoutrement and assume he must be an insider, they want answers, Jake insists he knows nuthink and he wants answers himself, and pretty random chickie Alice seems to know a lot more than everyone else, yet every time she preps to give Jake the skinny he wanders off. Maybe he just isn’t that desperate to get to the truth? Anyway the final hour sees Jake learn about his past and the bracelet, everyone learns more about Dollarhyde than he cares for, and quite a deal more information arises about Alice. There is a section that is cowboys and naughty cowboys, another which is cowboys and Indians, and finally the payoff cowboys (and Indians) and aliens. For what it’s worth the aliens look way too big for their ships, and I had them pegged as a bit (H.R. Giger) Alien, a bit Kuarto and a bit Predator. Harrison Ford does little but purse his lips and wonder if this is really better than Indy 5 (it is) in more a supporting role than a headliner, Daniel Craig similarly broods a lot and when he does manage to spit out a couple lines sounds exactly like Buffalo Bill from the Silence of the Lambs, and Olivia Wilde sure is pretty in a role that in short confused the hell out of me. And Sam Rockwell is in it. Though now hours after watching the film I can’t think of why that might be important. 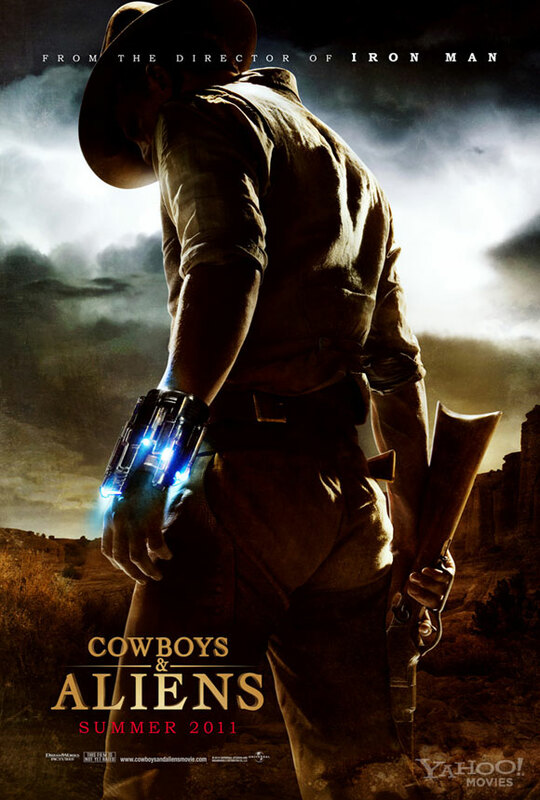 Cowboys and Aliens is vaguely entertaining and totally disposable, it has nothing that will referenced, copied or discussed in years to come, not even spoofed in one of those lousy Epic/Disaster/Date movie moron efforts. Now that it is here it is simply one of countless films that exist, unremarkably so. Final Rating – 6 / 10. 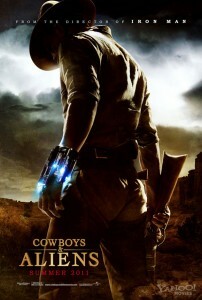 Cowboys and Aliens is here. It will make a lot of money for a lot of people, then will be swiftly forgotten. Daniel Craig will still be 007. Harrison Ford will still be Indiana Jones or Han Solo. Jon Favreau will still be the guy who made Iron Man.